Pappy Truck Rig From Manoanim - the whole creature being rigged on www.manoanim.com. 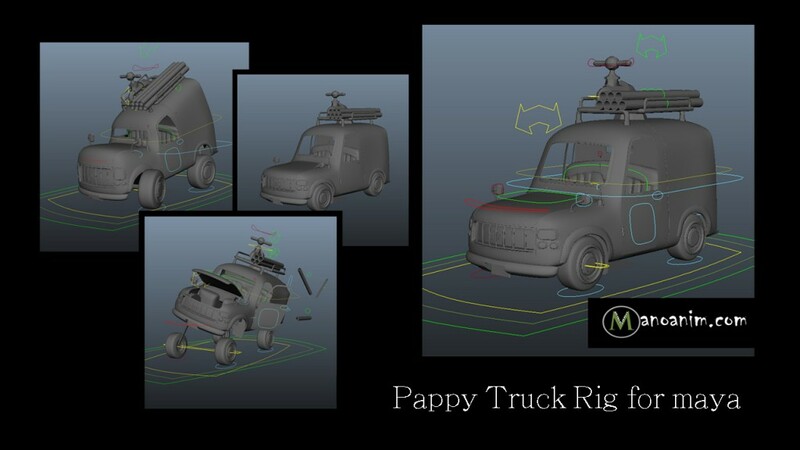 ".. this rig was super fun to play around with, great shapes"
The Pappy Truck Rig was modelled by Shaun Keenan, who came up with the great design and wireframe. Manoanim applied the rig and added the nessecery cartoony rig style to it to make it fit its style and purpes. The rig is free and can be picked up at no charge but your email. Its a fun little rig with a major amount of flexibility go ahead and give it a spin! Also remeber to report back if you have feedback or errors! Chances that you hit a mistake will be equally big for others so I am keen to hear from you!